Le Cirque, famous in movies and novels, is located in the heart of Manhattan. Since 1974, Le Cirque has attracted the rich, famous, and those who want to see those, along with great food.On a family vacation in 1974, Le Cirque's proprietor, Sirio Maccioni, was faced with empty cupboards. He did what any good home cook would: He threw together what he did have. From that, the world-famous Pasta Primavera was born. Heat 2 tablespoons of the olive oil in a medium sauté pan over high heat. Add tomatoes, half of the garlic, and a pinch of salt and cook until tomatoes have rendered their juice and begun to color, stirring or tossing occasionally, about 4 to 8 minutes. Set aside and keep warm. Heat 2 tablespoons of olive oil in a medium sauté pan over high heat and sauté the mushrooms with half of the remaining garlic and a pinch of salt until they've given off most of their water and are browned, about 8 to 10 minutes. Set aside, season to taste, and keep warm. Heat the remaining 2 tablespoons of olive oil over medium high heat in a large sauté pan, add remaining garlic, and cook the blanched vegetables until they've taken on a little color but are still firm, about 5 minutes. Set aside, season to taste, and keep warm. Bring a large pot of salted water to a boil. Meanwhile, reduce the cream by half in a pan large enough to hold the cooked spaghetti, stir in the Parmesan and butter and turn the heat to low. Cook the spaghetti. When the spaghetti is 1 or 2 minutes shy of al dente, drain and transfer it to the pan with the reduced cream to finish cooking. 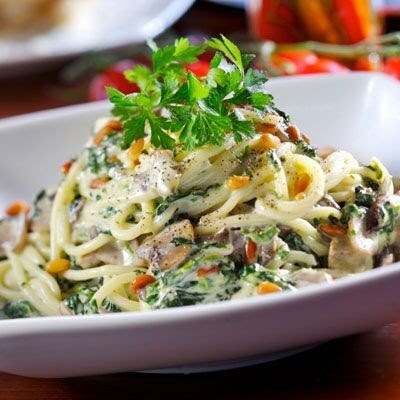 To serve: Transfer the spaghetti and cream to a warmed bowl large enough to hold all the ingredients and bring it to the table, with the reserved tomato sauce, mushrooms, sautéed vegetables, and the pine nuts each in separate bowls. Toss the spaghetti first with the mushrooms, then the vegetables, then portion it into warmed pasta plates. Garnish each plate with toasted pine nuts, 2 spoonfuls of tomato sauce, a pinch of basil, and freshly grated Parmesan, with salt and pepper to taste.